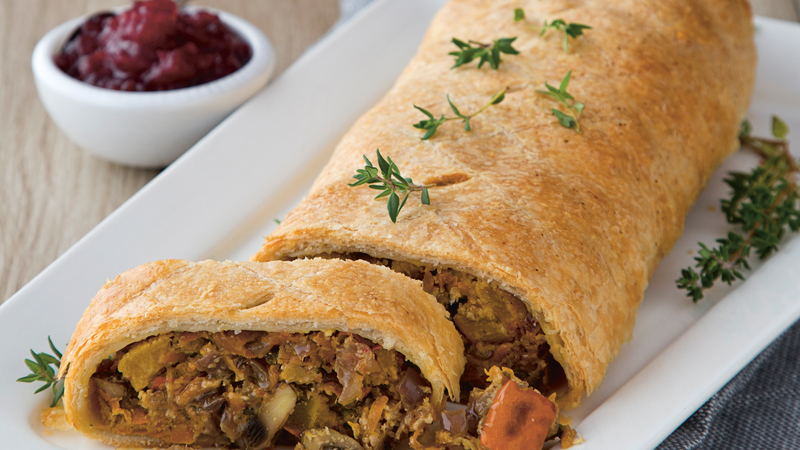 A wonderful Wellington to wow your guests. This makes a stylish centrepiece, is easy to make and is a guaranteed crowd pleaser as a vegetarian main or starter. leaves, stripped and chopped. Plus a few extra sprigs for garnish. 1. Remove one sheet of puff­ pastry from the freezer the night before and put it in the fridge to defrost overnight. 2. The next day, preheat the oven to 200°C/gas mark 6. 3. Cut the pumpkin into small bite sized pieces, leaving the skin on and discarding the seeds. Put the pumpkin on a baking tray and toss with 1 tablespoon of the oil and a pinch of salt. Roast in the oven for 25 minutes, until soft. 4. Meanwhile, boil the kettle, then pour the just-boiled water over the cashews and let them soak for 10 minutes. This will soften the cashews and make the sauce creamy. Drain and rinse the cashews and put in a blender along with the soy milk, lemon juice, garlic powder and 1 teaspoon of salt. Blend until super smooth and creamy. 5. Heat 2 tablespoons of the oil in a large frying pan or pot on a high heat. Add the onions and sauté for 5 minutes, stirring regularly, until they start to brown and turn slightly translucent. Add the carrots, mushrooms and a pinch of salt and cook for 5 minutes more, still stirring regularly. Add the tamari or soy sauce and cook for a further 2 minutes. 6. Add the roasted pumpkin to the pan along with the thyme and sage. Add the creamy cashew sauce, then increase the heat to high and cook for 3 to 4 minutes to reduce and thicken the ‑ filling. Taste the – filling and season if you think it needs any more salt or pepper. 7. To assemble the Wellington, reduce the oven temperature to 180°C/gas mark 4. Line a baking tray with non-stick baking paper. 8. Roll out the sheet of defrosted pastry to make it a bit larger. Put the – filling in the centre third of the pastry, leaving a third of the pastry clear on either side and also leaving a little space on each end so that you can properly seal your Wellington. Form the ‑ filling into a smooth mound. 9. Bring the pastry around the – filling from both sides and both ends so that it covers the ‑ filling completely to make a neat sealed parcel that the pastry overlaps. Carefully transfer to the lined baking tray, turning the Wellington over so that the seam side is down. Lightly score the top of the pastry in a diagonal pattern to form a criss-cross e­ffect, then use a pastry brush to brush all over with oil to give the Wellington a golden-brown colour. Use the tip of a sharp knife to cut a few small slits in the top to let the steam escape. Bake in the oven for 25 to 30 minutes, until the pastry is golden brown, and the kitchen smells fab. Garnish with a few sprigs of fresh thyme. Cut into slices and serve with cranberry sauce on the side. Save time by making the filling a day ahead and storing it in the fridge. The chilled filling is also easier to shape.